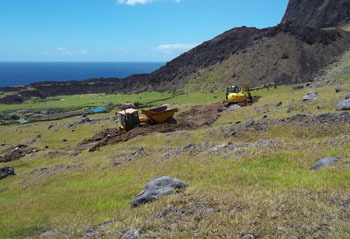 Details of the island's water supply system, both in the past and recent upgrades. 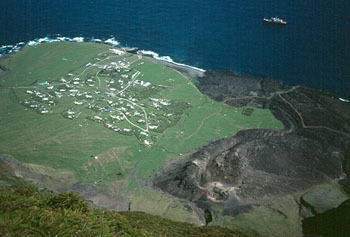 Tristan da Cunha's Settlement site was ideal as a strong stream of pure fresh water known as the Big Watron (thought to be a corruption of 'Watering') rose from a spring at the base of the cliffs, flowed north down the slopes of the Settlement Plain and then cascaded down the low cliffs to the sea. 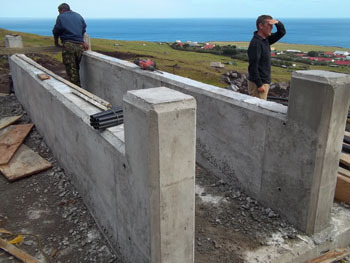 The lack of a similar good water supply ruled out other settlement sites on Tristan and outlying islands - here was the only spot where a community could thrive. In early days the stream was diverted to provide rivulets to give houses easier access to fresh water. 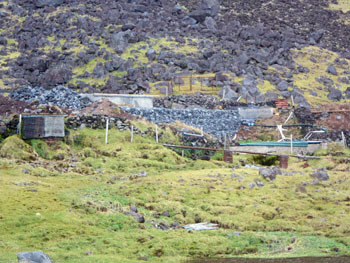 Above: Photo taken by the Editor in 1983 looking down into the crater of the 1961 volcanic centre showing how the lava flow miraculously left the Big Watron (and the village but not the fishing factory) intact to continue to provide fresh water to the community. 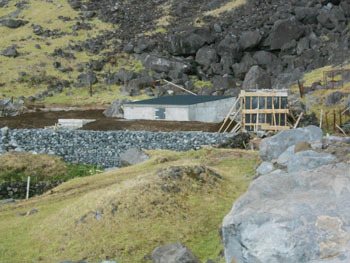 The spring and Big Watron can just be made out as it flows north between the lava flow and the village. In the early 1950s a water supply and sewage system was installed. Water from the spring was siphoned into a large header tank and pipes provided the newly established Big Beach Fishing Factory and every house with fresh water. Wooden- framed outside toilets were constructed (usually at the front) by every house. 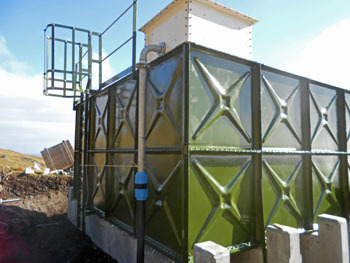 A sewage system linked to a cess-pit with excess outflow into the sea at Garden Gate Beach. The last remaining original wooden 'privies' outside one of the last thatched houses shown in this 1982 photograph taken by the Editor. Landslides triggered by earth tremors before the October 1961 volcanic eruption severed the water supply, but thankfully the eruptive centre and lava flows left the spring and Big Watron intact. 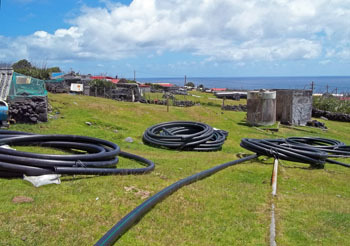 Pipes were quickly repaired by the Resettlement Survey Party in 1962 and the continuing provision of ample fresh water gave impetus to the full resettlement of the island in 1963. Those lucky enough to drink it will agree with the Editor that Tristan's water is of high quality, and the best you are able to enjoy from a public supply. The ample rainfall on the Tristan mountain percolates easily into the peak cinders, enters the ground and is filtered by the alternative ash and lava layers. There is no limestone or other soluble minerals to change the pure water so it emerges clear and cool at the spring. Left: October 2013 Photo taken from the helicopter of HMS Richmond showing the source area with the old water tank visible as a yellow rectangle with the wall-protected source area left, nestling below the cliffs just a few metres from the 1961 lava flow. Nevertheless the old header tank and pipework needed replacing and a decision was made to invest in a new water supply system, including a new tank and pump system. 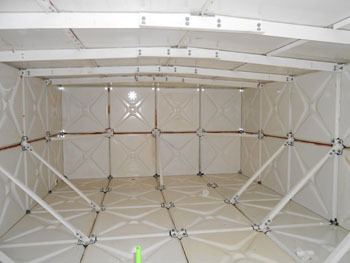 This page shows the installation of this system with the latest photos and report at the top. The Source Protection - this is completed with a new structure, source and valve chambers, gabion retaining walls, pipework and rehabilitation of the immediate area. 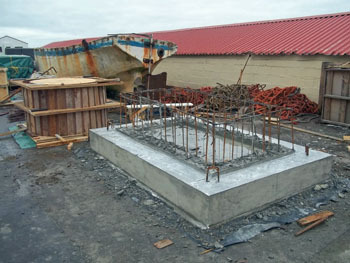 The New Water Tank - the structural base (designed to withstand seismic events), the 96000 litre steel tank, pipe connections, epoxy painting, gabion retaining walls and clearing of the site almost complete. Pipelines - the 110mm pipelines from the source to the Pump House and the 90mm pipelines from the Pump House to the Water Tank are all laid, backfilled and connected. 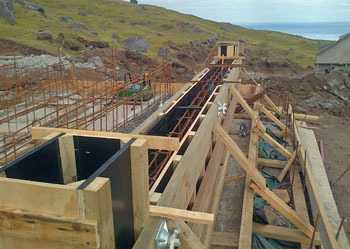 The 200mm washout pipes are now also laid and connected between the Pump House and the Big Watron. 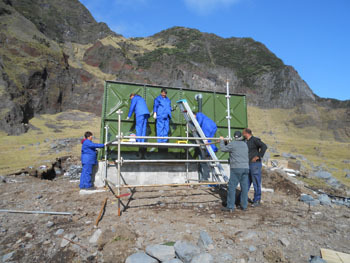 PWD ladies putting the final coat of epoxy paint on the water tank. 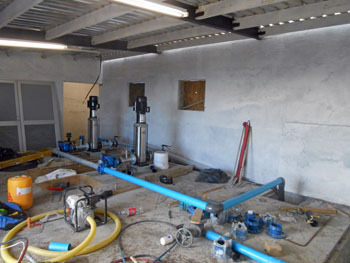 The Pump House - the structure is complete with pump sets, UV plant, pipework and electrics presently being installed, external works are underway with a system test date set for Monday 30th June 2014. Domestic Water & Fire Mains Installation: Teams led by Jack Green and Stanley Swain are progressing well with pipe trenching, laying and backfilling. They are also fitting connections and doing road crossings. 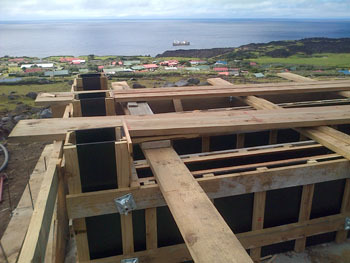 There are three 90mm ring main loops being installed with 63mm sub-mains to feed each adjacent area/street connection followed by a 20mm supply pipe to each house/building. Most of the 90mm and 63mm pipework is completed with the 20mm still to be started. Right looking north across the Settlement with MV Edinburgh preparing to leave for Cape Town on 25th February. As IMC's representative on the Water Supply Project, it was with mixed emotions that I watched the Edinburgh leaving for Cape Town the other afternoon - not least because there was a strong probability I might have been one of its passengers. Fortunately, things turned out differently and my stay was extended. My short time on the Island has been a huge learning curve, especially in the art of self-sufficiency - evident in every aspect of life here. The islanders have an approach to living that puts the rest of the world to shame. They stand up for each other; they take care of the aged; and they rally around those in need with no expectation of reward other than help when they need it themselves. I have witnessed the community gathering at one home to put on a new roof, delighting in the sense of fellowship and helping others, with a celebratory feast at the end of the day to reward all their hard work. As IMC's representative, I have been overwhelmed with Island hospitality. On more than one occasion I have had to walk home with pockets bulging with beers I dare not drink - placed in front of me with little said apart from "for you my brother". Those who have been working with me have expressed a great desire to learn new skills. 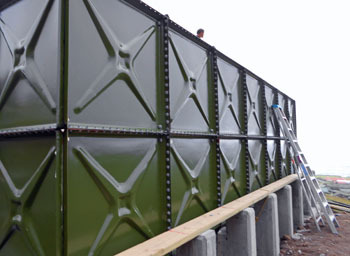 At first, there was a certain amount of reserve but steel fixing, leveling, formwork, planning and harbour repair have all become subjects of brand new interest and enthusiasm. 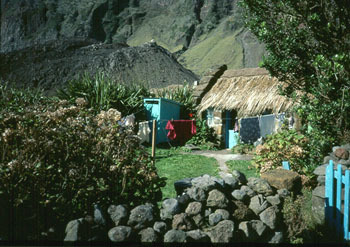 I will leave Tristan da Cunha enriched by my experience - taking away with me some serious lessons on life, unity and survival that the Islanders have taught me. I am very grateful to have been given the opportunity to work here and share my skills with people so eager to learn. I really admire and respect these unique members of the human race. 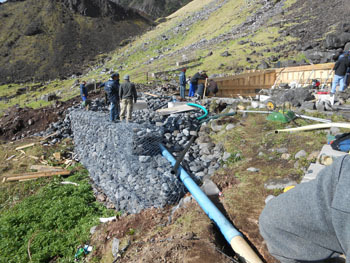 The Water Reticulation Project was led by Robin Repetto with two teams of 14 men working alternate weeks. 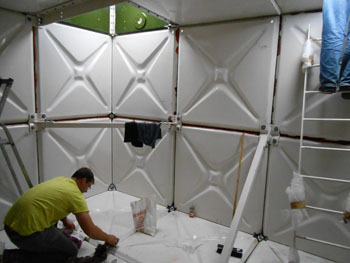 IMC Consultant's Supervisor on site is Victor Cinamon. A new water reticulation network is being implemented including Source Protection, New Tank, Pump House and Domestic Supply. 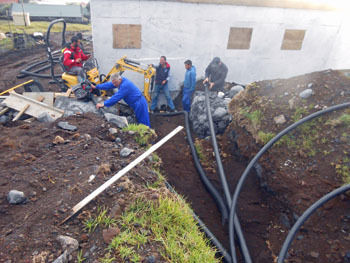 The Water Reticulation Project provides a comprehensive and updated system, including an enhanced supply to the Settlement, renewing domestic supply pipes, and increasing the capacity of the water storage tanks.